The Elephant Rock is volcanic basalt sea-cliff on the island of Heimaey in Southern Iceland that resembles a giant elephant or wooly mammoth dipping its trunk into the sea. This is found in Vestmannaeyjar Archipelago town residing nearly 4,500 residents in an area of 5.2 square miles. Despite of this small amount of population, it is still considered as one of the most populated island of the location. 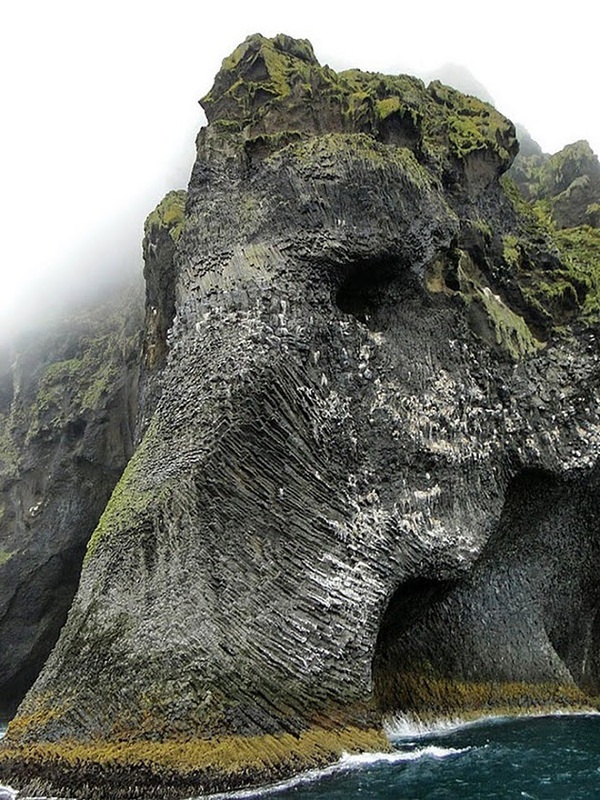 The major reason behind formation of this Elephant rock is 660 ft. high active volcano named Eldfell (Mountain of fire). The volcanic eruption happens occasionally without any prior alarming activity and the inhabitants have to rely on sea water for cooling down the erupting lava. Due to these activities, various types of rock formations keeps happening around the location.